This Thursday we're looking at Padlet and Screencastify. I'm always pleasantly surprised when teachers I work with have already discovered Padlet. It is a nifty tool for collaboration as well as creation if you're looking for ways for your students to curate their learning. My recommendation is that you create a free account. It's free. One of the major advantages of having an account is being able to name your padlet rather than attempt to share what I call the incomprehensible combination of letters and numbers. Once you get to the site and login with your free account, you click on one of the two indicated buttons to create a padlet. Okay, I could explain this to you but it's just easier to show you. 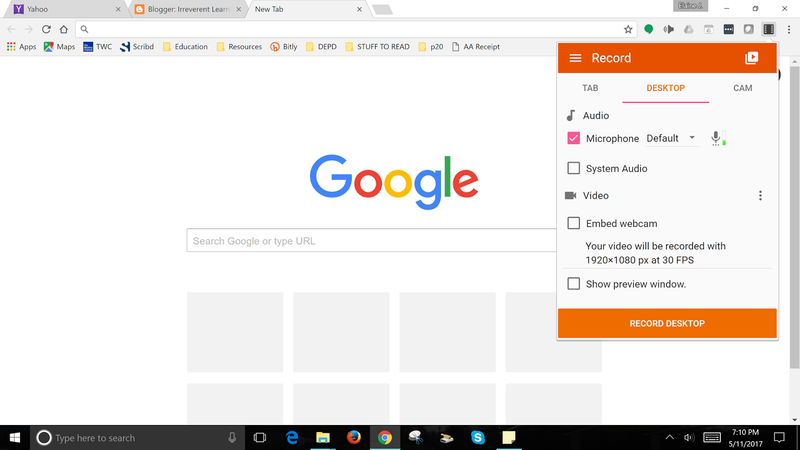 Screencastify is a really easy-to-use Chrome extension but it's important to note it is a Chrome extension. What I like about Screencastify is how easy it to use. The lite version gives you access to the fundamental features. You set up the microphone, let the extension know you want to record your screen, and click the record button. You'll get a countdown and be good to go. You'll have the option of storing your video on your Google Drive or a YouTube channel, or both. You'll be able to download your video, etc. In other words, there's a marvelous opportunity for students to create videos of their learning and save those to Google Drive with the option to share it to a Google Classroom, should you be using Google Classroom. There are some additional features if you're willing to pay the $24/year for the subscription. Is it worth it? Maybe. I suppose it depends on how many videos you plan to make and how you plan to use them. If you want to create videos to share with colleagues and others in the profession, you might want to pay the $24 to upload to a YouTube channel but also to convert it to a downloadable .mp4 file. But, before you pay the money (even though $24 isn't a lot compared to how much money you're already spending for your students), play with the tool to make sure there is real value for you. If you're using Screencastify only with your students, don't bother. When you've finished recording your video, you can copy the link saved to your Google Drive so you can post those links to your Google Classroom (or elsewhere). You'll want to test this to ensure you know how these features work with your school/district network.